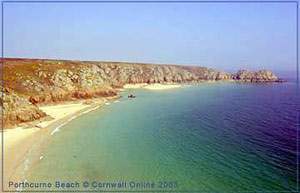 Porthcurno Beach is located some three miles east-southeast of Land`s End. The beach at Porthcurno has remarkably fine white sand formed from ground sea shells. There are magnificent views of the turquoise-tinted bay from the clifftop footpath. The beach drops into the sea quite steeply, so is more suitable for experience swimmers -for children, there is a stream at the top of the beach, ideal for paddling. There are toilets, car parking and a small cafe at the entrance to the beach. There is a Lifeguard service present in the main summer period, between 10am-6pm. One mile along the coast is the Logan Rock, a huge naturally balanced piece of granite weighing 80 tons, said to have been dislodged at the beginning of the last century by a young naval officer, a nephew of Oliver Goldsmith. 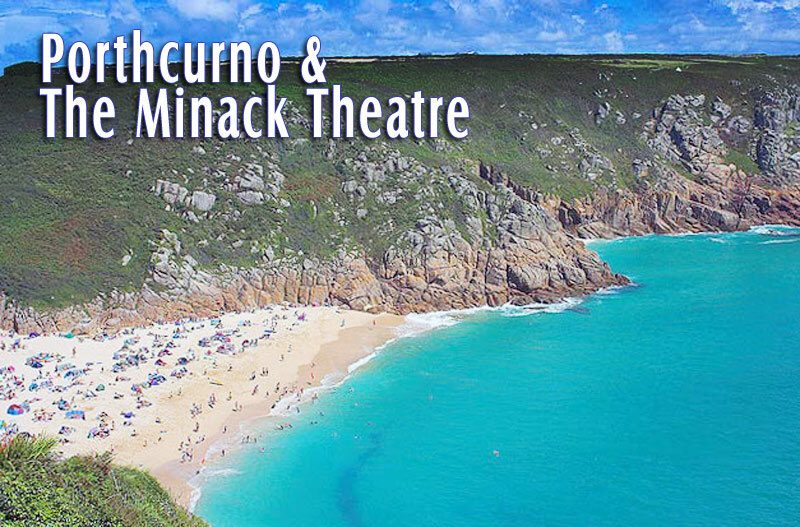 The Minack began in 1929 as a makeshift venue for a village play, staged in the cliff-side garden of Miss Rowena Cade. The daughter of a mill owner, Rowena was born in a village near Derby in 1893. After the First World War, Rowena moved to Cornwall and built a house overlooking the sea near Porthcurno. Rowena, became involved with a local theatre group which staged an open-air production of A Midsummer Nights Dream in 1929. For their next project, The Tempest, the theatre group needed a more dramatic stage. Rowena initially planed to use her garden, but then decided to create a stage on the cliff-edge below her house. With no previous experience and advice from her gardeners, Rowena took the first steps in the construction of the theatre that exists today. 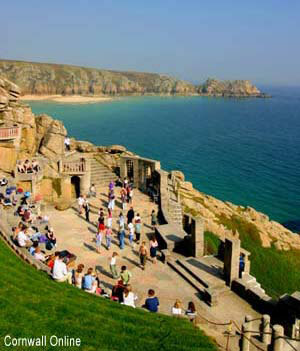 The first performance of "The Tempest" in the summer of 1932 was lit by car headlights batteries powered by batteries supplemented by power taken from Minack House. There is now an exhibition centre at the Minack outlining its remarkable history. The present theatre can seat an audience of 750 and is open for a 16 week summer season. Since 1998, the sub-tropical rockeries at the Minack have become a must for gardeners - especially those in search of exotic - salt tolerant succulents that thrive in the harsh coastal environment. The ideas and plant selection are based on the cliff garden developed here by Rowena Cade in the 1930s. A unique award-winning museum set in its own grounds in the Porthcurno valley chronicling the unusual and fascinating story of the village from Victorian times to World War II - as a centre of advanced technology. The Porthcurno valley was, at one point, the hub of international cable communications from 1870-1970 - where many of the submarine telegraph cables( transatlantic and to all corners of the British Empire), came ashore. 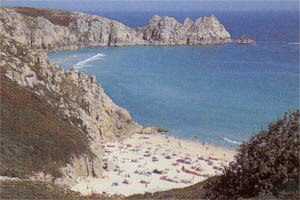 There was also a training college for the communications industry based at Porthcurno until 1993. In 1870 the picturesque valley of Porthcurno became the epicentre of global telegraph communications when using the most advanced technology of their day the first undersea telegraph cable was connected between Porthcurno and Bombay, with cables laid under the sand. 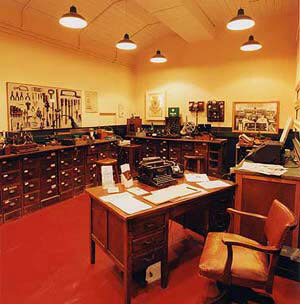 The role of Porthcurno's communication centre was boosted during World War II. Because of Porthcurno's importance to wartime communications and vulnerability, the station was relocated into a underground tunnel created in the granite hillside by local tin miners. There are two connected tunnels. The main entrance was protected by double bomb and gas-proof doors and at the rear an escape tunnel lead to the hilltop above. The telegraph ceased operation in 1970 and reopened as a museum with exhibits located in the tunnels.